Blessed are those who mourn.. The time has come for us all to dine elegantly amidst the dead, as we are inclined to do in style and grace.. It is the summertime. The time has come for us to escape the stifling heat of the cities, not to mention the choking fumes of the Industrial Revolution..
To the country! To the GARDEN! music: Seth Bedford, "Suite de Cafe"
Before you embark upon the Steampunk Cherry Blossom Walk and Lantern Lighting Ceremony, come and dine in elegance with us at the Victorian Cherry Blossom Picnic! Dress: Victorian, Neo-Victorian, Edwardian, Jazz-Age, Rococo, Regency, Imperial, Steampunk, Dieselpunk, Gothic Victorian, Semi-Formal, Asian-influenced dress a plus! What to bring: Consider this like the "Cemetery Potluck", except in the spring instead of fall.. bring blankets, silverware, glassware, and small snack items (especially if your name is ladyaelfwynn.. hehe). We will locate the best possible spot for our picnic and hang there.. Afterwards Amber Dionne will be hosting a Steampunk Walk and Lantern Lighting Ceremony starting at 2:30 until 5:30; consequently, the picnic will only be from 12:30pm until 2:30, but she ensured that we are free to "crash" her walk with our combined elegance and make it a grand old time! music: Tarja, "Damned and Divine"
Come and dine amidst the dead in elegance and style! 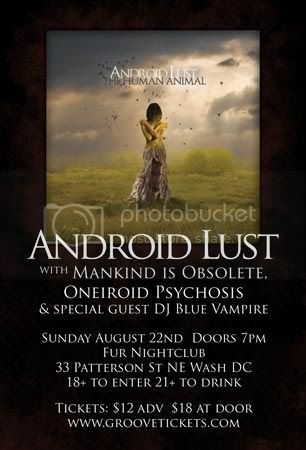 music: Nightwish, "Phantom of the Opera"
Tea Party hosted by the Guild of DC during the Autumn Stroll!! 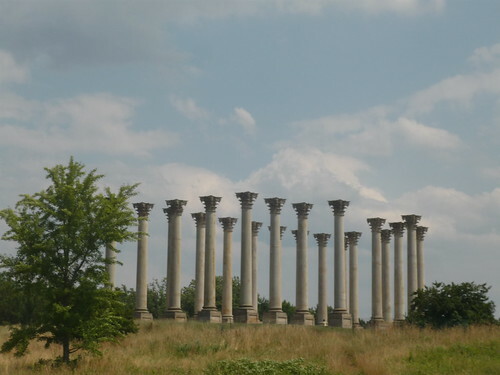 The Stroll takes place between 1 and 5PM EST at the National Arboretum in Washington, DC. The tea will take place during this time. More details as they come..
Come and stroll, wear your Victorian finery, and bring tea to share! music: Epica, "Design Your Universe: A New Age Dawns, Pt. 6"
music: Nightwish, "Over the Hills and Far Away"
Activities will include walking, so be prepared.. you will see lovely bonsai, delightful herbs and flowers, and the magnificent Corinthian columns! 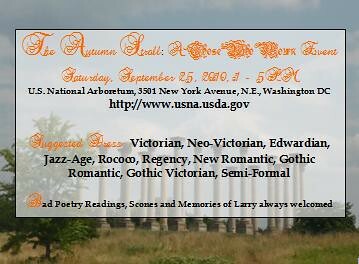 Come and stroll with us at those_who_mourn on Saturday, September 25 at the Autumn Stroll!